For four Detroit Cass Technical High School incoming seniors, summer hasn’t been all about pool sides and campfires. Instead, it’s been mostly early morning labs, science symposiums and exploring the University of Michigan’s Ann Arbor campus. 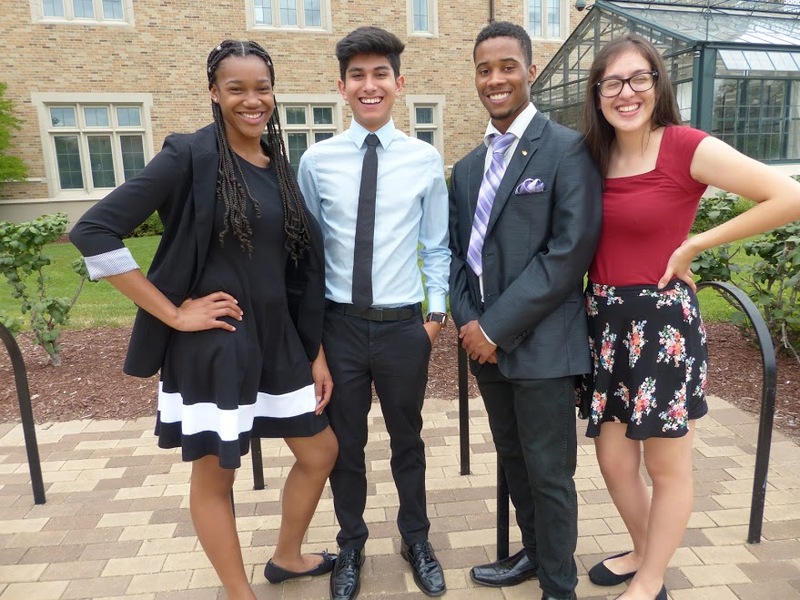 Since late June, Rashad Prendergast, Stephanie Camarena, Sharmylla Littleton and Ronnie Alvarez have been attending classes and conducting research projects facilitated by graduate students and post-doctoral researchers as part of the Detroit Research Internship Summer Experience program. The program, known as D-RISE, is now in its third year. It provides summer internships to high school students through a Cass Tech/U-M partnership. 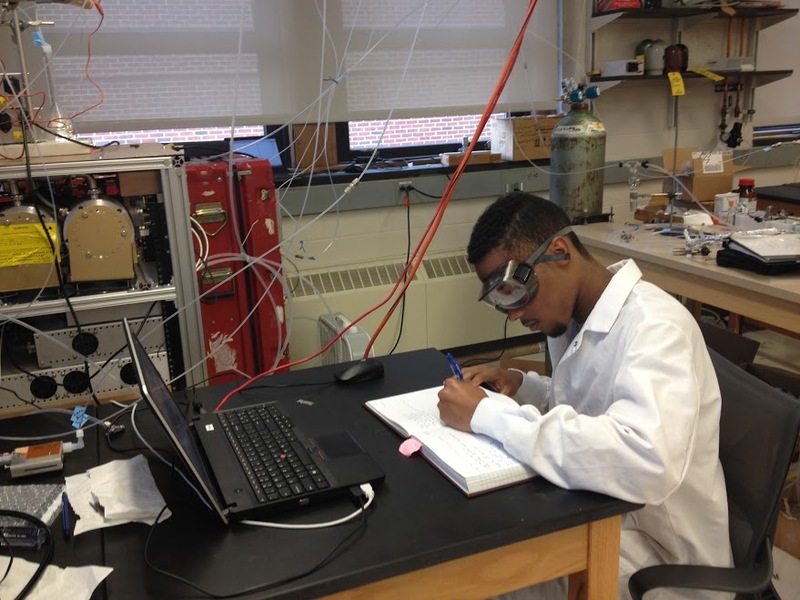 During the internships, students perform full-time research for seven weeks in a chemistry laboratory, all while living on campus as U-M students would. The goal is to increase underrepresented minority participation in the sciences by motivating the participating students to attend college and pursue careers in science, technology, engineering and math fields. Prendergast takes notes during a lab experiment. “It is expected that the research experiences that these students receive will, without a doubt, have a major impact on the students’ educational future,” says Nicolai Lehnert, D-RISE coordinator and professor of biochemistry and physics at U-M.
Camarena, for example, says her research this summer has involved studying the pH levels of highly acidic aerosols and how they impact human health and the environment. As a 16-year-old native of Detroit, she says this has been an experience that she never thought she’d have. “When I came here it was really an eye opener. I never thought I’d get to use the kinds of machines I saw people using in YouTube tutorials and things like that. But now I’m actually doing it and using the same equipment I see professional scientists use. And the purpose behind the research really benefits the people and the environment,” she says. 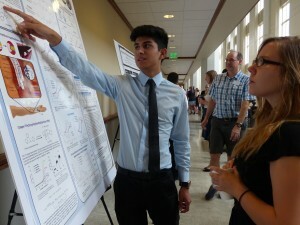 Alvarez explains his research during a science symposium. For Alvarez, a 17-year-old Detroiter, he says the program has provided him a leg up in understanding the college experience. He thinks it also will help separate him from other candidates when he’s ready to apply to colleges in the fall. “Since being here I’ve had to learn and adapt really fast, but I’ve also discovered how passionate I am about a career in science. I really never thought I’d be excited to be in a chemistry lab, but I’m always looking forward to it now,” he says. 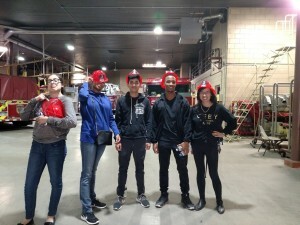 In addition to their time learning in classrooms with graduate students and other professionals, the Cass Tech students, along with their campus adviser and mentor Callie Chappell, have gotten the opportunity to enjoy campus and beyond, as many of their adventures have taken them all around Ann Arbor. Chappell – a master’s student studying molecular, cellular and developmental biology – says she’s taken the students to visit Ann Arbor staples like Zingerman’s and the cascades at Argo Park, and they’ve also enjoyed the Ann Arbor Art Fair as well as performances at local theaters. “I think one of the big benefits of D-RISE is that it not only integrates research experience – which is, in itself, really valuable – but also, it gives students that hands-on experience about what it’s really like being in college,” Chappell says. 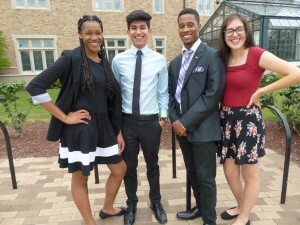 (Left to right) Sharmylla Littleton, Ronnie Alvarez, Rashad Prendergast and Stephanie Camarena, four seniors at Detroit’s Cass Tech High School, pose for a picture during their U-M internship. 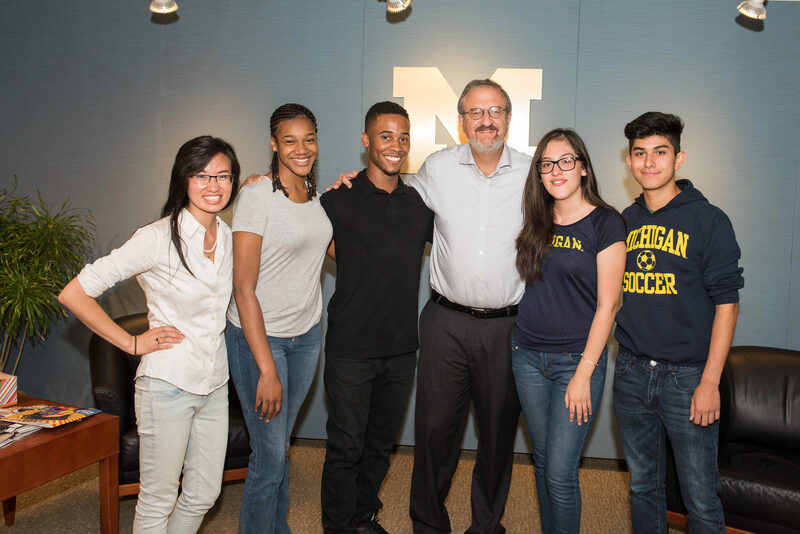 Outside of their lab work and Ann Arbor sightseeing, one major highlight for the students was getting the opportunity to meet U-M President Mark Schlissel. It was a goal of Prendergast, 17 of Dearborn Heights, when he first arrived on campus. As Chappell asked the students about what they hoped to experience during their seven-week internship, Prendergast said emphatically how he wanted to meet Schlissel, who has a background in biochemistry. “I mentioned on the first day wanting to meet him because I just thought it would be a really cool experience to talk with the president of the University of Michigan. I’ve always wanted to go here and having that opportunity seemed like a once-in-a-lifetime thing,” he says. Schlissel was excited to meet with the teens. He was able to arrange for the group to come to his office to chat with him about their interests in the sciences. During the visit he talked to the group about how important the university’s outreach programs like D-RISE are in helping foster the interest of younger students. Alvarez and Camarena say other highlights of their internship included their preparation and presentations at two collegiate science symposiums. One was the Karle Symposium at U-M, geared toward Ph.D. students and post-doctoral chemists, and another was at the University of Notre Dame where the group presented in a poster session alongside undergraduates. During the Karle Symposium, people were so impressed with Camarena’s research they mistook it for that of a Ph.D. student’s. Along with mentor Callie Chappell (far right), the students enjoyed several off-campus excursions. “I think that really speaks to the quality of the research they’re doing. They’re doing this research at a graduate student level and, at minimum, the level of an undergraduate level that someone in a lab would be researching,” Chappell says. All of the students said they would return to Cass Tech for their senior year with a renewed sense of drive and enthusiasm. Littleton says the lasting impact of this program will help carry her through her last year of high school, and that the experience has her more eager to attend college science classes than she’s ever been. Lehnert notes that two of the four students who participated in the D-RISE program in its first year are now Michigan students, with one studying chemistry and the other studying biochemistry, while a third is at Stanford University. 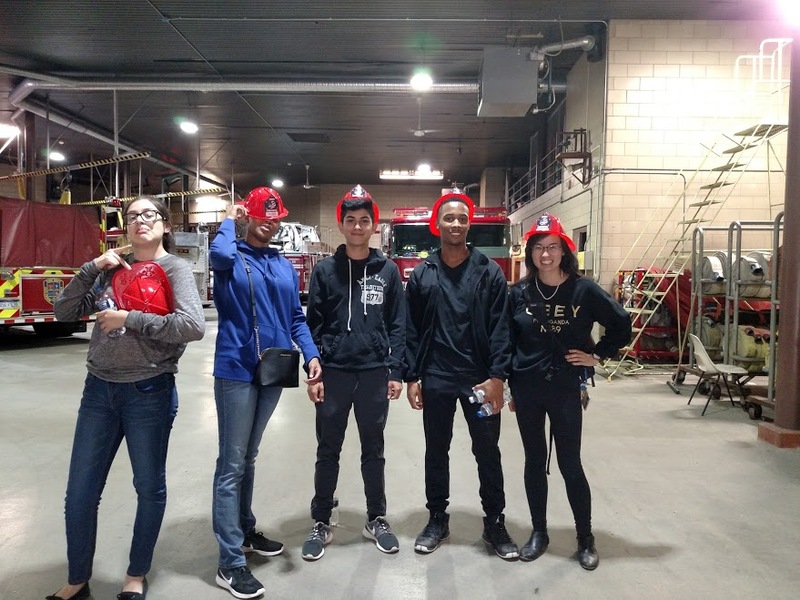 Of the five students who participated in 2015, the second year of the program, one now attends Wayne State University and the other four recently graduated from Cass Tech and have all applied to U-M.